Five Thunks from a fun-packed evening at Vicarage Road. 1- Well I have to confess to not having seen that coming. The continuing absence of H and the Duke still on the bench didn’t particularly lift the spirits on the way into the ground either. It’s never as much fun as when you don’t expect it, is it…? 2- Speaking of which, Angela’s performance had not been suggested by his previous outings. Strong, confident, elegant, direct, and utterly unplayable. More please. 3- Having said all of which, Wednesday were pretty shocking. They were ropier than us defensively, and whilst Tudgay looked sharp there was next to nothing going on around him. And quite what Michael Gray, the most left-footed player ever, was doing on the right flank is beyond me. 5- Having, whilst hanging the washing, frequently overheard two of my younger neighbours debating the various merits of the big four ad infinitum whilst kicking a ball around, I took the bold step of inviting the pair, both nine years old, to watch, you know, a proper football match, in the stadium and everything. The morning after, both are gushing about the experience and Josh is wearing a brand new replica shirt. My work here is done… (with a bit of help from Angela, Danny, Tom et al). 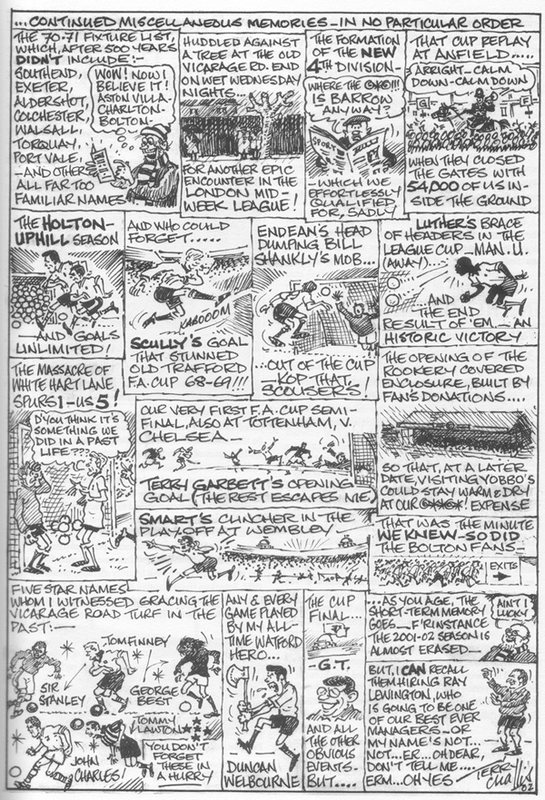 For those of a certain vintage – well, quite a number of vintages – the cartoons of Terry Challis are as much a part of the identity of their own personal Watford as the memorabilia, the programme covers, the photographs that clouded around the football club to form something worth a special place in anyone’s heart. You won’t need to have a Terry Challis cartoon in front of you to conjure up an image of that familiar style in your mind’s eye: the pithy, witty and often rather insightful commentary on the week’s events, followed by the inevitable highlighting of the last game’s star player, name embossed underneath. In days before blanket coverage and instant highlights, it always seemed particularly vital after a distant, unseen away game, as much a part of the reportage as Oliver Phillips’ account alongside. If the Watford Observer was essential reading for so many years, it was because there was an ethos behind it all. A commitment to quality, a strongly-opinionated but essentially constructive outlook, a sense of personality behind the names. It was an ethos that echoed the club in good times, but put it into rather awkward relief when standards at Vicarage Road slipped. For me, Terry Challis’ name will always ring loudest in the largely barren nineties. It was one of the times when Watford Football Club most needed some wry commentary…but also when it needed the essentially positive tint he applied with great subtlety to his work, even at the gloomiest of times. It needed that ethos, an ethos that he so helped to shape and represent. Yeah, well. He did Watford proud. Thanks, Terry. 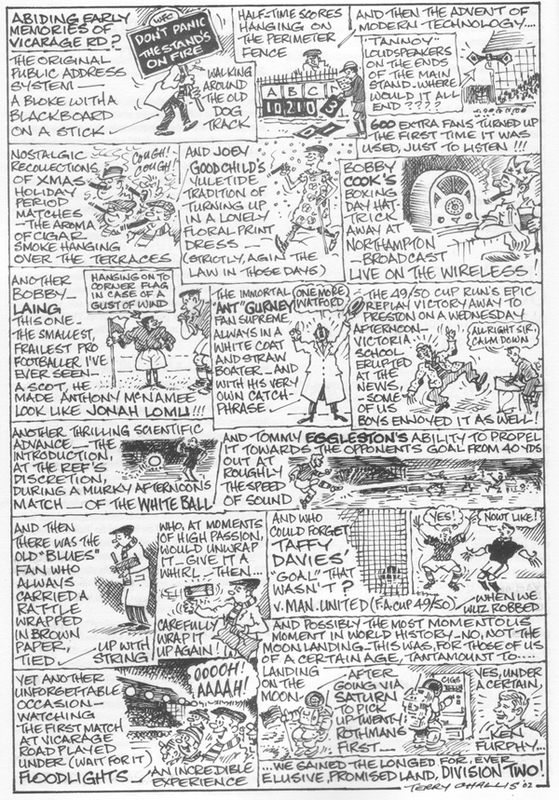 Terry Challis’ cartoon from the You Are My Watford book. Click on the thumbnails to enlarge. Enjoy.